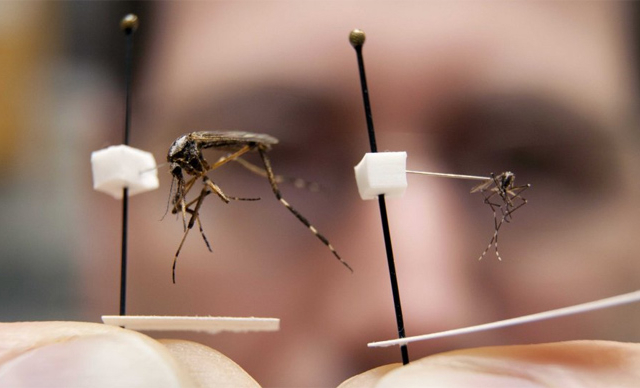 The FDA just approved a plan to genetically modify mosquitos and release them into the wild. This August, the Food and Drug Administration approved a plan by Oxitec to use genetically modified mosquitos as a weapon against the wild female population in cities and states where cases of the Zika virus have been found. This initiative has the potential to contain and even eliminate diseases and viruses that are generally spread by mosquitos, by targeting the most common, and most harmful, species. The Aedes Aegypti is a smaller, stealthier mosquito that loves feasting on humans. As a result, this type of mosquito generally lives, breeds and eats where the people are and can generally withstand harsh conditions like extreme cold and extreme heat. They are tiny, and their size oftentimes let their bites go unnoticed. They are the kind of mosquito that prefers smaller, more frequent meals, and takes small, painless bites on people’s ankles, legs and arms. But it’s not the annoyance of the bite that has health professionals worried; it’s the fact that being bit by an Aedes Aegypti almost guarantees the transmission of at least some bacteria from another human. In some case, that bacteria can be deadly. The Aedes Aegypti is the primary carrier of diseases and viruses such as yellow fever, dengue fever, chikangunya and of course, Zika. Their small size and unnoticeable bites allow them to spread disease with terrifying efficiency, and some have spread diseases and viruses to thousands of people each year, sometimes leading in death. As this mosquito thrives, we’ve let the situation slowly spiral out of control. Though we do use insecticides, sometimes poorly, recent studies have shown the Aedes has begun to develop a resistance to those chemicals, rendering them useless in controlling their growing masses. So how do we control a growing population of would-be-carrier mosquitos? Rather than focusing on the current insects, experts are turning to the eggs. A female mosquito can lay around 1,000 eggs in her lifetime, generally in close proximity to people, and can survive months without water, waiting for the ideal conditions to hatch. Oxitec, a biotechnology company, has come up with a plan that will reduce the spread of disease through mosquitos by wiping the population out entirely. Their plan is to release millions of genetically modified male mosquitos carrying a lethal gene into the Florida Keys. Male mosquitos don’t bite, so their purpose is to mate with wild females and pass the lethal gene to their offspring, preventing new mosquitos from being born. By sending millions of genetically altered mosquitos into the wild, Oxitec predicts it’s only a matter of time before the wild population goes extinct. It’s sort of like giving male mosquitos a really bad STD that prevents the female from ever having kids. This initiative could mean the end of diseases spread by mosquitos, like dengue fever and malaria. It also means using less pesticides on our crops and discontinue previous attempts of containment, like spraying Naled into our air. Still, there are some who oppose any plans in which one animal or insect is used to wipe out another. Some people have expressed concerns that using genetically modified mosquitos would be ineffective in controlling the spread of disease, especially if the Zika virus happens to spread to mosquito species outside of the Aedes Aegypti. Others are concerned with the ecological risk, like when we brought the mongoose to the Hawaiian Islands in an attempt to subdue the rate infestation. They soon found that the mongoose, who is active during the day, was not interested in the rat, who is active at night, and instead preferred feasting on many of the islands’ birds and their eggs. The rat problem continued to grow, and Hawaii’s bird population began to decrease. The most popular argument against genetically modifying mosquitos, however, is a monetary one. While Oxitec executives say the cost of their technology is less than the cost of pesticides, they are unable to provide a full cost breakdown. Experts in the field estimate that it costs around 10 cents per mosquito to implement and would take millions of mosquitos in order to see results. This cost would significantly increase the mosquito-control budget. For now, using genetically modified mosquitos as a way to control the Aedes Aegypti appears to be the best option we have in controlling the spread of viruses and diseases. Oxitec is currently working on technology that would allow us to target the eggs themselves at a lower cost, but those plans are still in the works. Meanwhile, the Zika Virus continues to spread through the South of Florida. We’ve done little to control the spread of mosquitos over the last decade, and that negligence has led to dengue fever and chikungunya. With the threat of Zika on everyone’s mind, controlling the mosquito population is as important as ever, and the use of genetically modified mosquitos may be our best bet in containing the virus and preventing its spread.